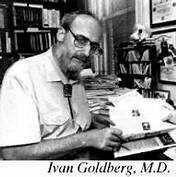 Ivan K. Goldberg, MD, passed away on November 26, 2013. He was seventy-nine years old. Many considered Dr. Goldberg—I always called him “Dr. Ivan”—to be a psychiatrist-psychopharmacologist who was in a class by himself: world class. He was a one-doctor Mayo Clinic, working from an unpretentious, studious-cluttered office on the Upper East Side of New York. As an undergraduate, Dr. Ivan attended Johns Hopkins University and then New York University for his medical degree. For over twenty-five years he was associated as a teacher, researcher, and clinician with Columbia University College of Physicians and Surgeons. Dr. Ivan was held in the highest esteem by his psychiatric colleagues, not only in New York City but throughout the United States. He successfully treated many cases of severe psychiatric illness, those “treatment-resistant” cases that often baffle other psychiatrists. Dr. Ivan was one of the first physicians to embrace the Internet, beginning in 1986. Soon, he built an Internet Discussion Group where professionals in the mental-health field could discuss the intricate factors of psychopharmacology. Later he founded Depression Central, an Internet clearing house for hundreds of peer-reviewed articles, not only on affective disorders but across the entire psychiatric spectrum. Dr. Ivan truly was a prince among therapists. His burly physique and psychopharmacological brilliance belied an intensively empathic, supportive, and dedicated soul. He saw countless patients who traveled from far and wide to see him, and he humbly remained ever-grateful for whatever healing he provided. There are many of these that Dr. Ivan’s family, patients, and colleagues will remember and cherish.